Our pilgrimage begins with an overnight flight to Frankfurt. Roman town of Trier Welcome to Germany! After touching down in Frankfurt you are welcomed by your Tour Manager and bus driver! We leave the airport and travel to amazing Trier. 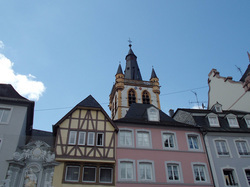 After lunch on own in Trier we enjoy a guided tour of the more than 2000 year old town of Trier. See the Porta Negra, an impressive former town gate dating back to 180 AD. Continue the walk and visit the Romanesque Cathedral. The tour of the Cathedral will bring you to the oldest Roman part of the Cathedral dating back to 3 AD. See also the Roman Basilica, named after Emperor Constantine and conclude the tour with a visit to the Imperial Roman Baths. Celebrate private Mass In Trier. After the tour continue to our hotel in the wonderful Rhine Valley. Dinner at the hotel or local restaurant. We leave our hotel in the morning and enjoy a day trip to Cologne. The main focus of the visit is the amazing Cologne Cathedral. 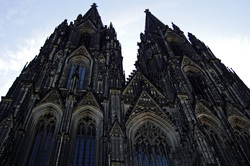 Building began during the Gothic times and was finished by the Prussian Empire in the 19th lunch on own we will tour the old town on foot and then visit the Cologne Cathedral. After the visit celebrate a private Mass at the Cathedral. After some free time return to the hotel in the beautiful Rhine Valley. Dinner is at the hotel or local restaurant tonight. In the morning we check out of our hotel and walk to the pier across from the hotel to enjoy a 1 hour cruise on the Rhine River. Be intrigued by the hanging vineyard slopes and the many medieval castles you will see while cruising this beautiful part of the Rhine. 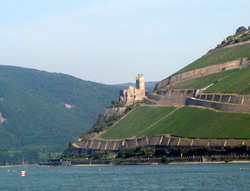 First we visit the wine village of Rüdesheim where you can enjoy a lunch on own. We then continue and visit the Abbey of St Hildegard, dedicated to Hildegard von Bingen. St Hildegard was a German writer, composer, philosopher, Christian mystic, Benedictine abbess, visionary, and polymath. Pope Benedict XVI named her Doctor of the Church on October 7th, 2012. Celebrate a private Mass at the Abbey. After lunch on own we leave the beautiful Rhine Valley and travel on to the medieval town of Rothenburg. Dinner at the hotel or local restaurant. 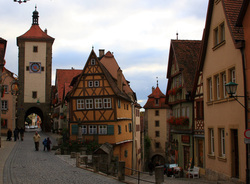 Today enjoy a guided tour of the medieval gem of Rothenburg. First mentioned in 952, it was a Free Imperial City from 1274 to 1806. It became a famous and rich trade & pilgrimage town in the medieval times. Partly destroyed during the religious Thirty Years’ War and then again during WWII it still stands out as the best preserved German medieval town with a 13th century town wall you can still walk on and enjoy amazing views of Rothenburg. Visit the St James Church, a Lutheran church from 1311, which serves as a church on the pilgrimage route to St. James Church in Santiago de Compostela, Spain. Its main attraction is the famous Holy Blood Altar from 1505 by Tilmann Riemenschneider, which holds a rock crystal reliquary cross containing the Holy Blood. Mass today at local church. After lunch on own and some free time we meet to enjoy wine tasting at a local wine place. Dinner at the hotel or local restaurant. Today we leave Rothenburg and transfer to our hotel in the Garmisch / Innsbruck area with a visit to the famous Neuschwanstein Castle and the beautiful pilgrimage Church Wieskirche, where we celebrate private Mass. After leaving Rothenburg we head towards the beautiful Bavarian and Austrian Alps. Upon arrival in Neuschwanstein enjoy lunch on own before heading up to the castle. 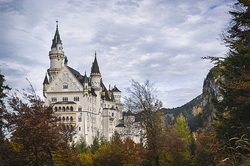 We take a mini bus up to the Marien Bridge from where you will enjoy beautiful views of Neuschwanstein Castle. We then walk to the castle and tour the castle with a guide. The castle was the last project of the Bavarian King Ludwig II and was never completely finished as Ludwig II died under dramatic circumstances at the age of 40 in 1886. The castle is truly worth the visit with the artificial grotto, the wood carved cathedral bed and the royal throne room. After the visit we walk down to our bus and go to the Wieskirche to celebrate private Mass. Afterwards we continue to our hotel in the Garmisch area. Dinner at the hotel or local restaurant. Today enjoy an excursion to Innsbruck and visit the Hofkirche with 28 life sized bronze statues of Tyrolean heroes, St James Cathedral and see the Goldenes Dacherl. Enjoy some free time in Innsbruck before heading to the Nordkette Mountain. 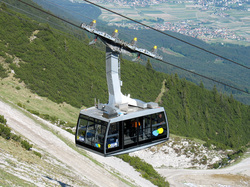 Start in the heart of the town of Innsbruck and take a cog railway up the mountain. Then change into a cable car and go up to over 7400ft. Mass today at local church. Dinner at hotel or local restaurant. After a wonderful breakfast we’ll visit the Ammergauer land in Bavaria and see the famous Benedictine Monastery of Ettal. We will visit the Monastery Church where we will celebrate a private Mass. Then enjoy an alpine cheese tasting at a local cheese place nearby the monastery. We then continue to beautiful Oberammergau. Oberammergau is famous for its wonderful wood carving tradition, the Lueftmalerei (house facade paintings) and of course the Passion play. The Oberammergau Passion Play was first performed in 1634 and is the result of a vow made by the inhabitants of the village that if God spared them from the effects of the bubonic plague then sweeping the region they would perform a passion play every ten years. 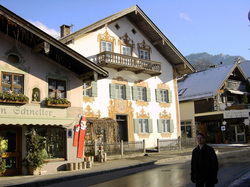 Enjoy lunch and free time in Oberammergau. Dinner at hotel or local restaurant. 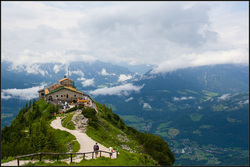 Travel to the Salzburg area today and visit the famous Eagles Nest and the town of Berchtesgaden. The Kehlsteinhaus or Eagles Nest is a chalet-style structure erected on a sub peak of the Hoher Göll known as the Kehlstein. 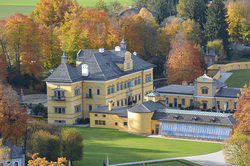 It was built as an extension of the Obersalzberg complex erected in the mountains above Berchtesgaden. The Kehlsteinhaus was intended by Martin Bormann as a 50th birthday present for Adolf Hitler to serve as a retreat, and a place for him to entertain visiting dignitaries. The US army captured this area May 4th in 1945 and subsequently the Allies used it as a military command post until 1960, when it was handed back to the State of Bavaria. Afterwards we visit the beautiful Bavarian town of Berchtesgaden where we will celebrate a private Mass. Travel on to our hotel in the Salzburg area. Dinner at hotel or local restaurant. Today we travel to Salzburg and enjoy a walking tour of the city. Before arriving in Salzburg we stop at the Castle Hellbrunn and see the gazebo where the song “You are 16 going on 17” was sung and filmed for Sound of Music. Upon arrival in Salzburg we are met by our local guide, who will take us on a historic walk through wonderful Salzburg where we will also see more original Sound of Music film locations. After lunch on own we celebrate Mass in Salzburg. Dinner at the hotel or local restaurant. We leave the wonderful Salzburg / Berchtesgaden area and travel on to Munich, our final destination of this wonderful journey. On the way to Munich we stop in Hufschlag to see the former family home of Pope Benedict XVI. His father was working as a policeman and had to move around quite a lot. This led to the family to changing homes quite often. Hufschlag is for Pope Benedict XVI his true home as he spent most of his early childhood there. Please note this is an outside visit/ view only. We continue on to Munich, stop for a visit at BMW world along the way, and then meet our local guide for a panoramic tour through Munich. 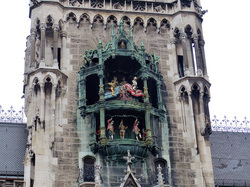 At the end of the tour we get to see the famous Glockenspiel. After lunch on own and some free time we will celebrate Mass in Munich at the Assam Church. Farewell dinner tonight. Overnight in Munich area. Depart from Munich airport to the USA with wonderful memories of our trip.